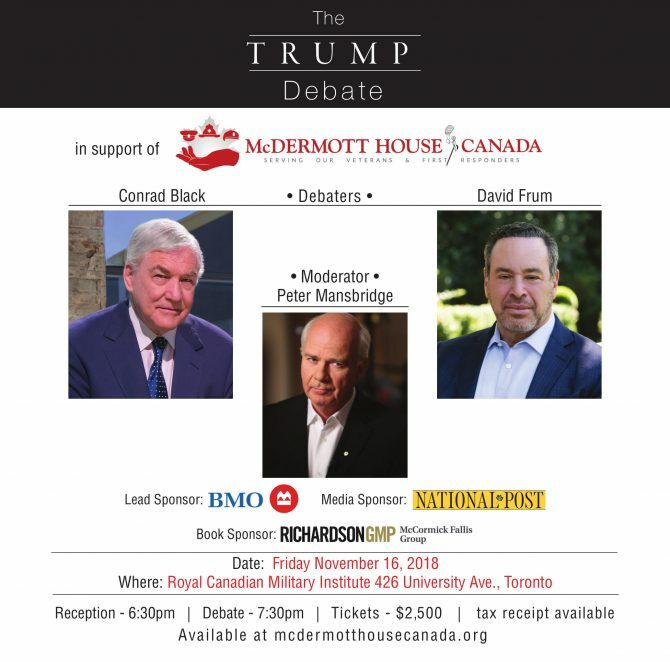 The Trump Debate with David Frum and Conrad Black. Our mission at McDermott House Canada is to help those who have served our country by creating a warm home-like environment that will set the standard for premier end-of-life care in Canada for veterans, first responders and community patients. McDermott House Canada has raised over $2.6 million for our first project with Sunnybrook Health Sciences in the renovation of Canada’s largest veterans centre, the K-Wing. The second phase is due to commence in early 2019 and with the support of donors through our gala and events like this we believe that we can meet our goal of raising an additional $1 million for the final renovations. Our exclusive event will be held on November 16, 2018 at The Royal Canadian Military Institute (426 University Avenue, Toronto, ON). The evening will commence with a reception at 6:00 p.m. and will conclude with a post-debate reception at 9:30 p.m. Guests will be provided with the opportunity during the reception to socialize with the evening’s special guests. This event will be a one-of-a-kind experience and there are a limited number of tickets available!